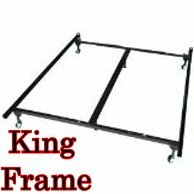 This bed can be purchased with or without the metal frame. Picture of frame below. The full/queen headboard is convertible and can be a full or a queen. If you already have a bolt on frame, you can purchase just the headboard to give your room a stylish look for alot less. Prices for bed does not include mattress & box spring.